Britain's Finest places to stay and visit - accommodation in luxury hotels, B&B and inns and the leading attractions, gardens, museums, galleries, historic houses, spas, golf courses, restaurants and wedding venues in the UK. 57 links pointing to Britainsfinest.co.uk were found. The most used keywords in text links are Britains, Britains Finest and Britain's. Individual words like Britain, Finest, Breakfast and Fulford are frequently used in text links from other websites. The most important links to the website are from Devonshirehotels.co.uk and Eshotthall.co.uk. 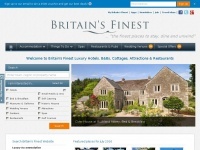 The homepage of Britainsfinest.co.uk and the subsite /bedandbreakfast/ are most referenced by other websites. The table shows the most important links to Britainsfinest.co.uk. The table is sorted in descending order by importance. The table shows websites of Britainsfinest.co.uk, which are often linked by other websites and therefore they are classified as important content. 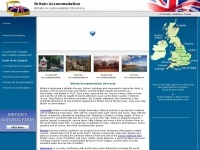 Britain-accommodation.co.uk - Britain Accom­moda­tion | B&Bs | Holi­day Cot­ta­ges | ..